Since the 1960s, hospitals have been pricking the heels of newborns—4.3 million a year—to draw blood to test for rare metabolic disorders. Because of its proven benefits, this screening has been mandatory. But as early as the 1980s, some states began storing these blood spots and providing them to researchers to study such problems as childhood cancers, autism and the effect of contaminants on development. Then, this past March, acting on court orders, the Texas Department of Health Services incinerated 5.3 million blood samples collected from newborns since July 2002. For the parents who brought the court case, the ruling is vindication for their anger over not having been asked permission for their children’s blood to be used for research. Yet scientists lament the extraordinarily valuable resource that’s gone up in smoke, and fear that samples in other states will also be lost. In a case in Minnesota last year, a judge ruled against parent groups, contending that such research did not compromise genetic privacy because each child’s identifying information was removed before the samples were given to researchers. The case is under appeal. Blood spots could provide a huge sample unbiased by gender, geography, ethnic or racial background, education and health status—unlike virtually all other samples used to study the prevalence or cause of a disease. They are also irreproducible snapshots of humans before their bodies have been influenced by contaminants, infections or diet. But critics argue that these samples constitute “human research subjects” and that states have violated individual rights. When parents find out about the research, some report being fearful about what the government might do with the information from their child’s sample. Others are simply irked that they weren’t asked permission and likely would have consented if asked, according to a 2009 study by Aaron Goldenberg, a bioethicist at Case Western Reserve University. What’s more, the resources required for obtaining informed consent could exponentially increase the cost of the studies and limit the number of available samples. “To understand the prevalence of a condition, you need hundreds or thousands of samples. You can never get a consent study that large without incurring incredible costs,” says Lisa A. Schimmenti, a pediatric researcher at the University of Minnesota who used blood spots for a 2009 study of the prevalence of congenital infections that might increase a baby’s risk of deafness. The upshot is that the controversy is distracting parents from the clinical utility of screening programs. “Instead of focusing on fear,” Goldenberg says, “we should be looking at what parents need: transparency on the part of health departments and education.” Otherwise, suspicion and distrust can undermine not just research but parents’ willingness to approve screening for their newborns—potentially jeopardizing the health of their babies. 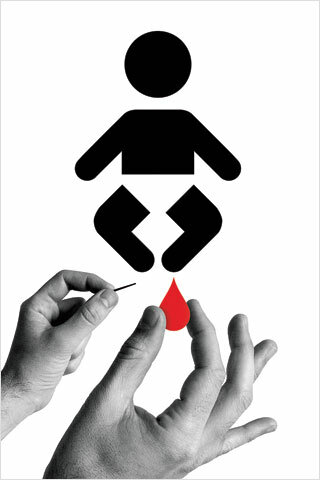 Babies’ blood samples for research: vital resource or violation of privacy? Share your opinion. A cholesterol test for 10-year-olds could show early signs of cardiovascular disease, yet critics foresee unnecessary treatment.